I've been surprised at the lack of publicity given to the 70th anniversary of Superman's debut in Action Comics #1 in the summer of 1938. We haven't forgotten the Septuagenarian of Steel, though, and in lieu of a drink (he'd never approve) we decided to salute him with ice cream and lots of pictures. 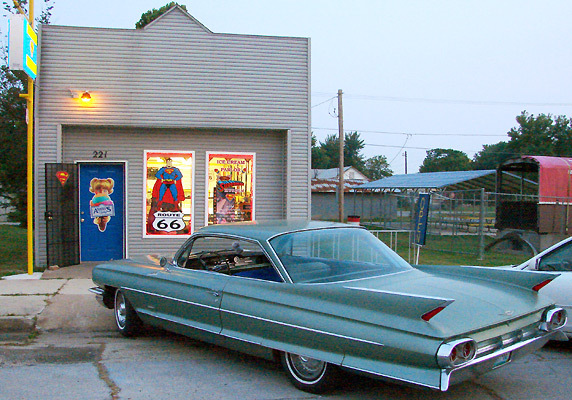 It turns out the ice cream part is easily done along Route 66 in Carterville, Missouri, at the SuperTam Ice Cream parlor. 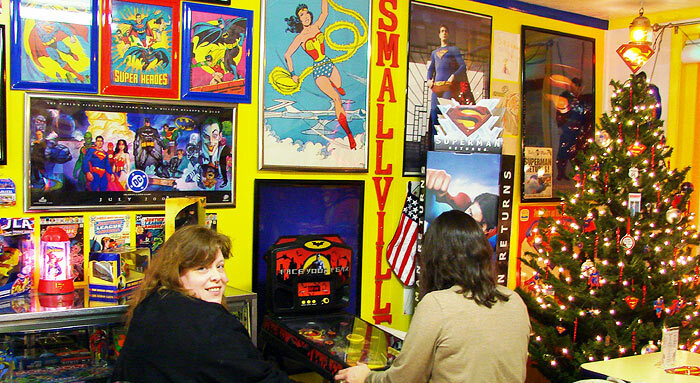 I've been taking photographs of it for a year and a half, and a visit last night with friends and family in tow spurred me to do something with the photos before Supe's anniversary year is over. 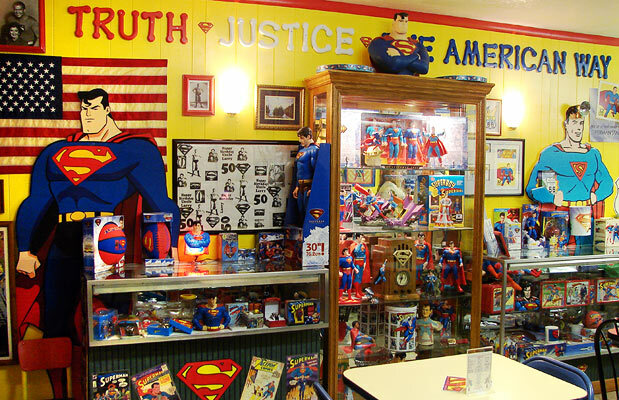 The place is decorated with more Superman stuff than I've seen almost anywhere from the owner's 30+ year collection. And it's perky, too. You can't decorate with such bright primary colors without being perky. 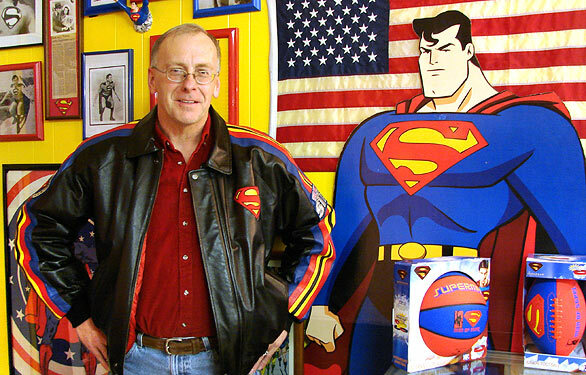 So, about the name - owner Larry Tamminen originally called the place "Superman on 66." Though, I don't think there ever was a sign on the building by that name. 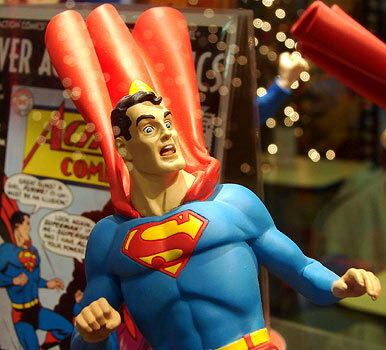 The legal forces of Time-Warner, which owns DC Comics and the Superman name, were not pleased. 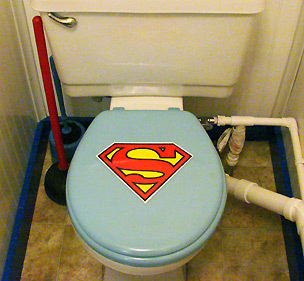 They swooped in and sent Larry a letter instructing him to drop the name of their copyrighted Kryptonian. 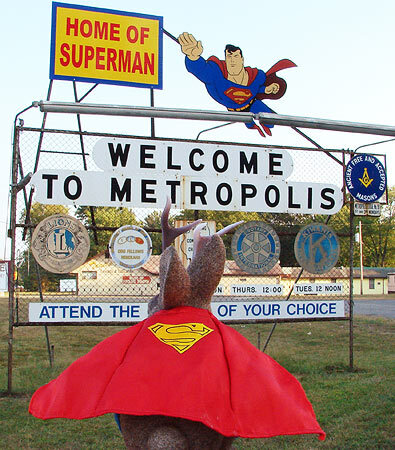 He told me just last night that the corporation is allowing him to keep the Superman shield on his sign until it wears enough to need to be replaced. 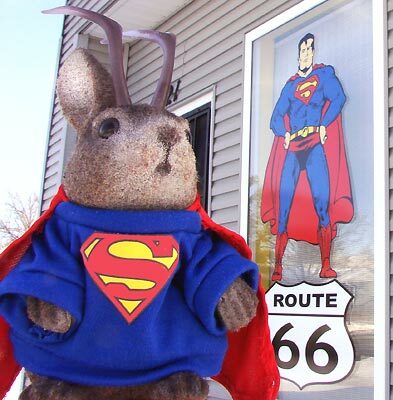 Then, he says, he'll replace it with a Route 66 shield. I'm glad Time-Warner didn't come down any harder. 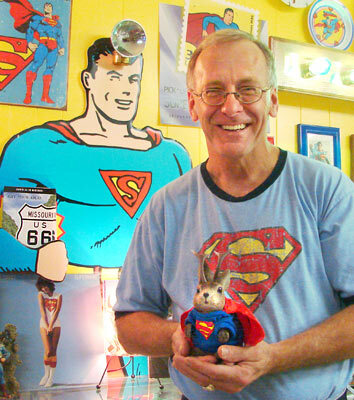 Larry is, after all, a contagiously enthusiastic supporter of the Man of Steel and the merchandise that carries the Superman name. 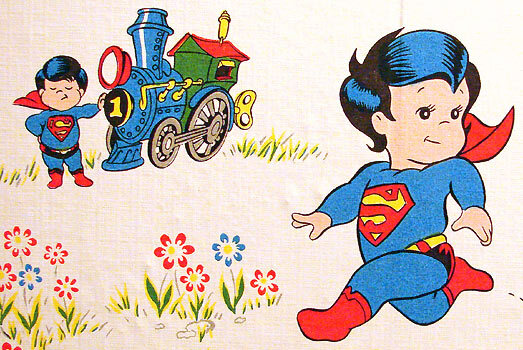 Last night I even saw a little boy playing with a red, yellow and blue toy in a basket of assorted Superman toys Larry keeps for kids' amusement. 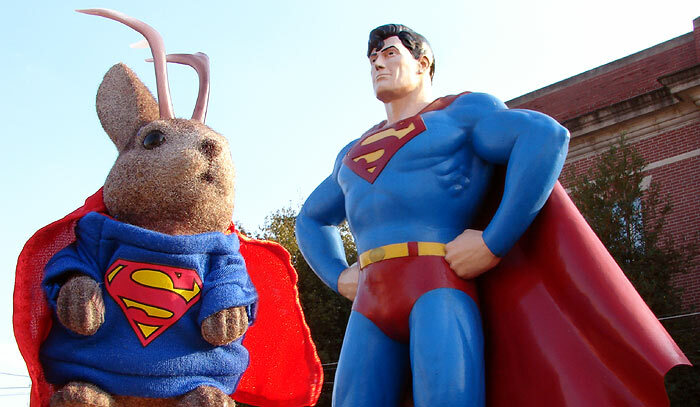 Thus, Larry is helping impress the Superman brand on another generation of potential consumers of licensed products. There's even kid-oriented wallpaper in the restroom that features DC Comics characters. 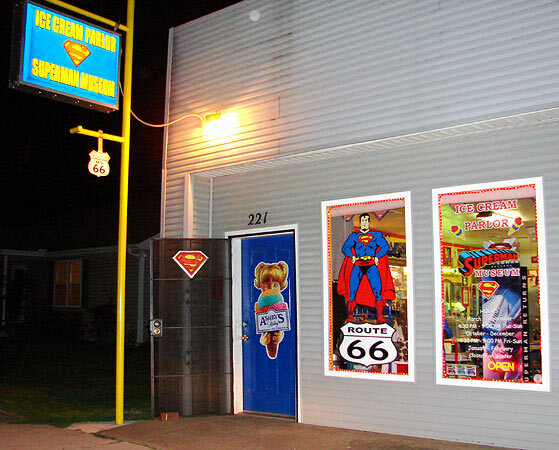 I'll even admit that after a visit last year, I stopped at the Joplin Hastings store and bought a Superman comic book, just to see what the ole' boy was up to. 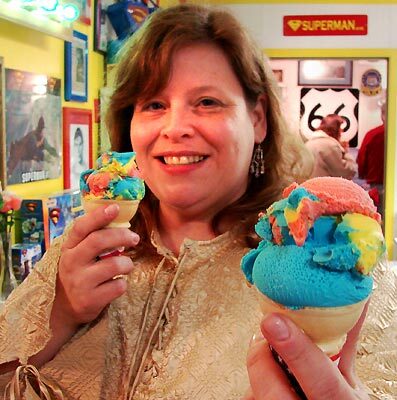 And here's a cone with two scoops of actual Superman Ice Cream, shown by one of Ace's chauffeurs. The stuff tastes a lot like bubblegum and sports Superman's colors of red, yellow and blue. Larry also sells several other rather tasty flavors of ice cream. 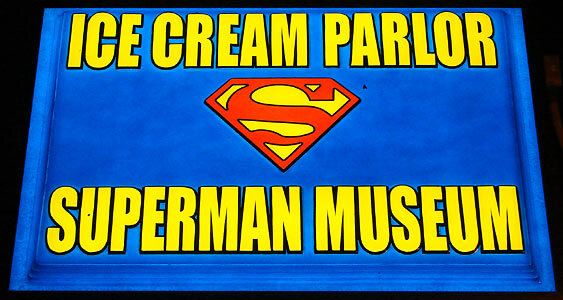 I heartily recommend Superman, Butter Pecan and Moose Tracks. Just to avoid any confusion I should point out that Larry does not make Superman ice cream. It's a manufactured flavor that has been around quite a few years, has its devotees, and is not as available nation-wide as many would like it to be. It seems to be somewhat easier to find in the upper Midwest. The maker of Superman ice cream has legal permission to use the name as far as I know. 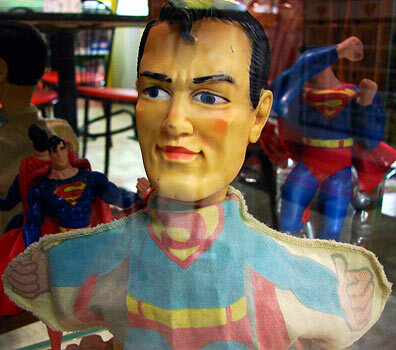 Larry says this cloth and plastic hand puppet is the oldest Superman piece he has on display at the store. 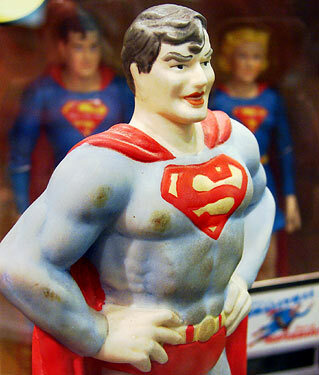 ...with this Superman by Enesco in which Superman looks like he's checking his lipstick. 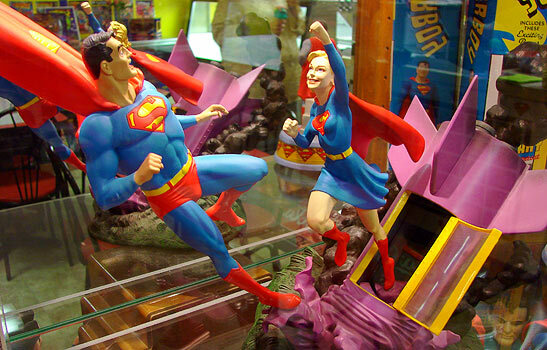 This statue represents Superman's first encounter with Supergirl. See the bottom of this post for more Supergirl stuff. 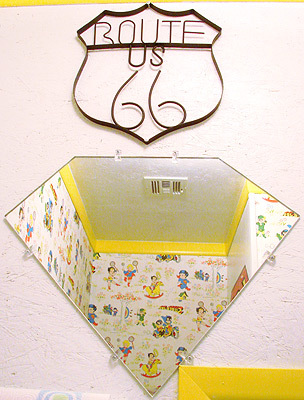 The parlor's location on Route 66 is echoed throughout the store, as it is here in the bathroom. 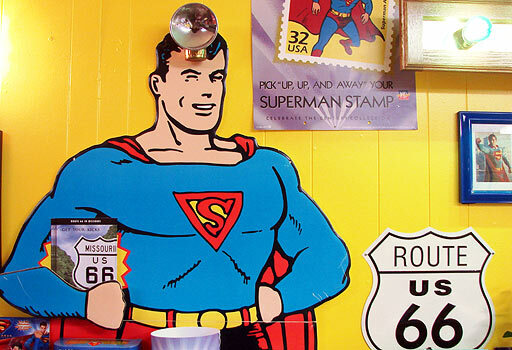 Carterville is an old mining area, hence the "sunshine lamp" on Superman's head. 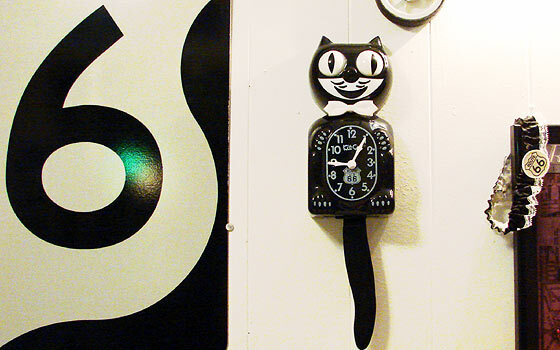 This Kit-Cat clock is a limited Route 66 edition. I wonder if Larry got it when the world's largest Kit-Cat clock caravan came through last year. 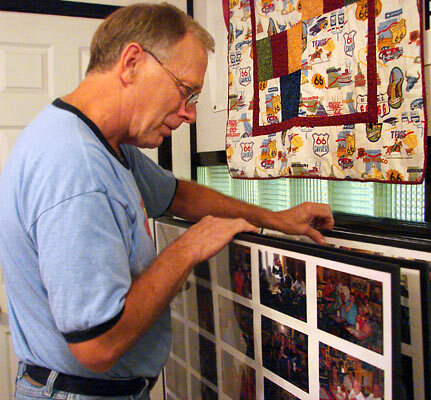 Larry tries to photograph all visitors the first time they come in the store. 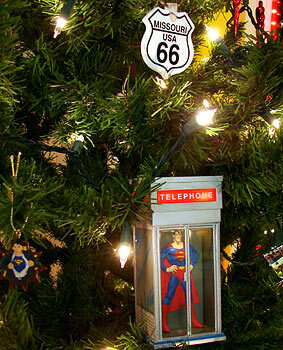 Two Christmases ago, we noticed a Superman-themed tree. 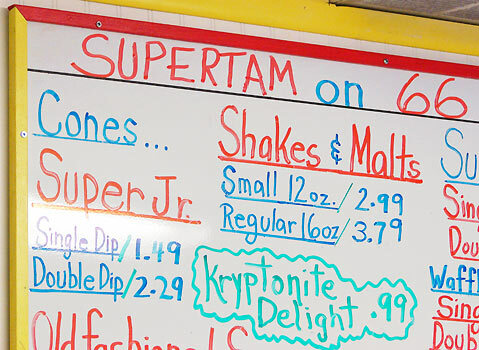 SuperTam Ice Cream is open (March - September) Tuesday through Sunday, 4:30PM to 9M. In October through December the parlor is open only Friday through Sunday 4:30PM to 9PM. It is closed for the winter in January and February. 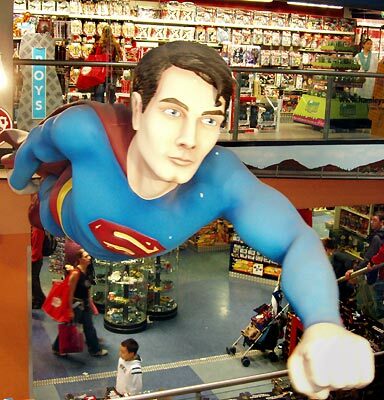 The huge fiberglass statue of Superman in flight at Hamleys Toy store in London in October of 2006. 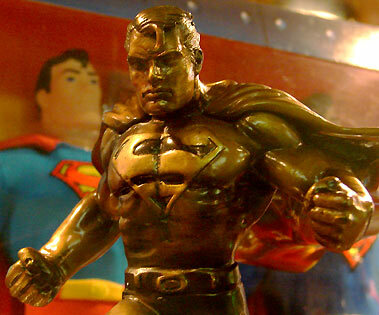 ...and a huge Superman statue at the end of the main drag. 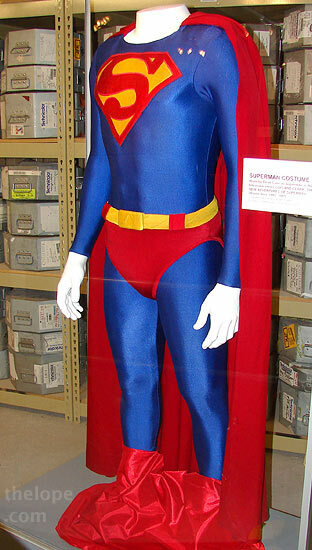 ...and a model of the Daily Planet used in the movie, Superman Returns. Go there; it's cool. Here's a Supergirl whose superpower is whining for money in front of Grauman's Chinese Theatre in Hollywood, August, 2005. 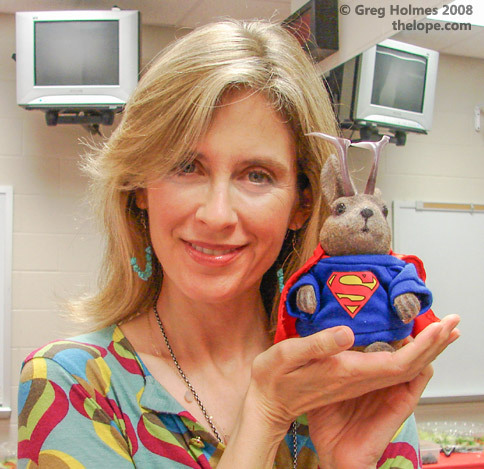 ...where we met actress Helen Slater who played Supergirl in the movie of the same name. I really tried to include Ace in this picture, but I can never seem to catch Ace and Superlope in the same place at the same time. 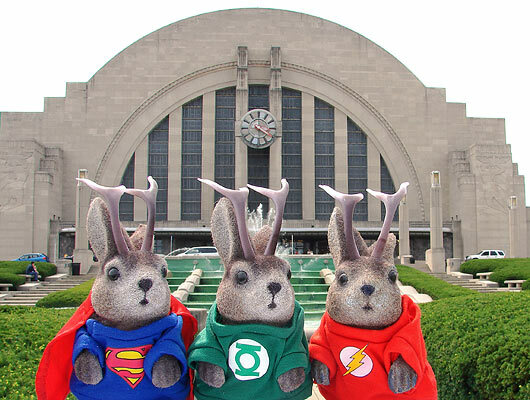 If you'd like to see the building on which DC's Justice League headquarters is based, check out our visit to the Cincinnati Union Terminal. And if you're into ice cream parlors, you may enjoy Aglamesis Brothers in Cincinnati. Ace -- Wonderful bit on SuperTam!! It is one of my favorite places on Rt. 66! And while I am partial to butter pecan as my favored flavor of choice, I can heartedly reccommend the Cherry Amaretto. It is not only cherry and amaretto, but it has chocolate chunks as well. Larry had to give me a spoonful of it 2 years ago to try it, but it something I've learned I just have to have 2 or 3 times a summer. And you know? This weekend might be a good time to make a trip that way! Thanks for reminding me! !